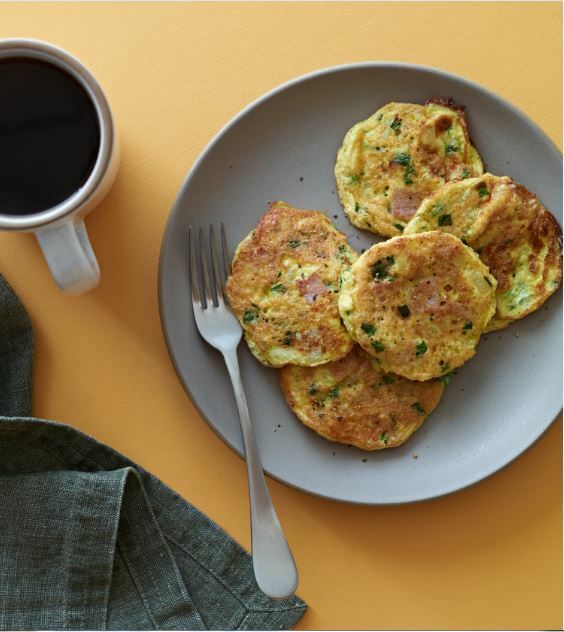 Here’s a terrific way to get some veggies into your morning in a delicious, easy way. I like to make the first half of these with no curry or red pepper for my kids, then add 1/2 the curry and red pepper in for the grownups. This way, we all win! I got the idea for these from my Ecuadorian farm interns who call these tortillas. I added the curry and a hint of heat to make these my own. Follow this recipe with the full amount of spices if you’re cooking for adults. This recipe is from my best selling book, Paleo Lunches and Breakfasts on the Go. In a medium sized skillet, warm the coconut oil. Add the onion and sauté for five minutes or until the onion is soft. Add the chopped spinach and sauté for about three minutes, just until it wilts. Remove from heat and place the spinach mixture into a large bowl. Into a hot pan, sauté the ham chunks until lightly browned, about five minutes. Remove from heat and add to the spinach mixture and set aside. Separate the eggs, adding the yolks to the spinach mixture and placing the whites in a separate bowl. Wisk the whites until fluffy. Gently fold in the whites to the spinach mixture, also adding in the potato starch, curry, red pepper flakes, cilantro, salt and pepper. Be careful not to over mix and deflate the fluffy whites. Once the mixture is incorporated, you’re ready to start frying them up. Warm the skillet over medium heat and melt 1 tsp of coconut oil. Drop about ¼ cup of the mixture for each pancake. When the edges look cooked and the bottom is light brown, flip and continue cooking on the other side until done.